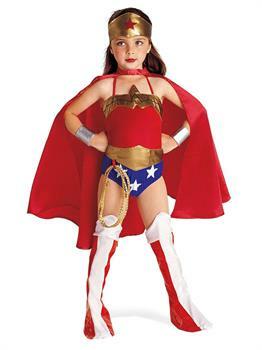 Costume includes: headband, cape, Red, leotard, belt and lasso, bracelets and boot tops. This is the officially licensed © DC Comics costume. The Princess of the Amazon will always save mankind from evil powers. Wonder Woman gained huge popularity over few years and became the strong feminist icon. You can portray a strong female character with Wonder Woman costume. Let her dress up in the most beautiful costume. Is she looking for a real drama for special event? Then let her dress up like a most dramatical character. Get into your favorite style with Justice League DC Comics Wonder Woman Child costume.